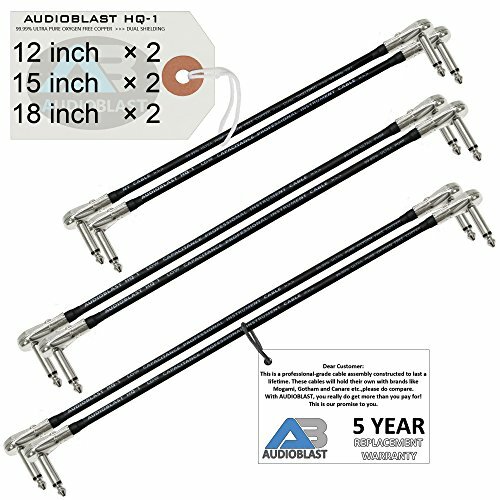 12 Inch x2 + 15 Inch x2 + 18 Inch x2 - Audioblast HQ-1 - Ultra Flexible - Dual Shielded (100%) - Guitar Bass Effects Instrument, Pedal Patch Cable with Premium Nickel Plated ¼ inch (6.35mm) Low-Profile, Right Angled Pancake type TS Connectors & Dual Staggered Boots - THE HQ-1 IS AN ULTRA-FLEXIBLE CABLE & CAN BE TWISTED WHEN "S" SHAPED PATCH CONNECTIONS ARE CALLED FOR BETWEEN YOUR PEDALS. IMPORTANT, PLEASE NOTE: The cable length is measured from TIP to TIP of each connector, this is the industry standard for measuring patch cables (the measurement details are clearly depicted in one of the images in the image gallery to further clarify the measurement process. There are many images in the gallery, please click on the main image to open the full gallery). Please also check out the connector dimensions, as the pancake design might be too wide for jacks that are spaced close together. Audioblast HQ-1 is a flexible professional-grade instrument cable ideal for a myriad of patching applications. The conductive PVC sub-shield, served shield & the ultra-pure Oxygen Free Copper core ensure higher levels of signal transparency & quality, cancelling almost all electrical interference & microphonics. Low capacitance of the HQ-1 will always faithfully bring out the true tone of your instrument. Audioblast cables are introduced to fill the need for a superior quality, professional-grade & affordable audio cable. Although made for rugged professional stage and studio use our reasonable pricing means that home users and enthusiasts alike will now have the pleasure of using these high-end, professional-grade cables without breaking the bank. We back this up with a 5 Year Replacement Warranty. Heavy-duty construction with the lowest profile pancake design in the market to save space. Staggered hand assembled Double Boot protects the cable from damage by handling stresses. Please also check out the connector dimensions, as the low-profile Pancake type design might be too wide for jacks that are spaced close together. We at Audioblast guarantee that this is a professional-grade product, we are focused on bringing the highest value to our customers, we back all our gear with a no questions asked 5 year Replacement Warranty. Our pricing is really groundbreaking, please do not judge our products based on their low prices, please try us out and you will be pleasantly surprised, please do not forget to compare our gear with legacy brands (we will meet and exceed your expectations!). This sale is for 12 Inch x2 + 15 Inch x2 + 18 Inch x2 cables. Cable length is measured from TIP to TIP as depicted in the images in this listing (please refer to the image gallery). Also check connector dimensions. 5 Year Replacement Warranty. If you have any questions about this product by AUDIOBLAST, contact us by completing and submitting the form below. If you are looking for a specif part number, please include it with your message.